Ok, I'm old school, I like the old school look and I have ALWAYS liked the fabric bra on cars. I finally found one for my car, and may just jump on it. What do y'all think? Good way to scratch the hell out of your paint and look like a grandpa in your badass muscle car. Go down to your tint guy and have a self-healing clear protector installed. 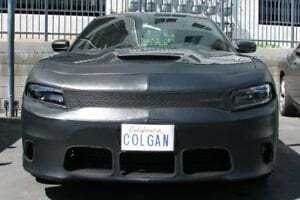 I've used Colgan before on a few vehicles and love the product. As long as you don't leave it on for extended periods it'll be fine. Never had an issue with scratches. The Colgan will require maintenance in the form of washing the backside and conditioning it. I have used their products before in the 80's. Quality is good, but the clear bra is a better but also more expemsive option. I just had the Xpel paint protection clear film installed on my 2019 300S and it looks great. Cost was $1100 for the extended hood and fender kit, front bumper, side mirrors and door cups. Before I took delivery my car, the front and rear bumpers were scratched all to hell, a headlight was damaged and it had West Texas sandstorm remnants in places there shouldn't be dirt. The dealership repainted the front and rear bumpers (quite crappily, I might add), replaced the headlight and gave me my car. After 4 trips to the dealer and several calls to Dodge, they won't repaint it. After 6 months, many clayings, compounding and polishes, I finally got all the over spray off the car, and MOST of the paint corrected. The front bumper is a lost cause though. Spending $1000 on clear protection is out. I figured this was a more affordable better camouflaging option. The bra is OK as I had one on a PT Cruiser. It was PITA to remove and re-install just to wash the car. Even bigger PITA to remove, clean, dry and the re-install. And an even bigger PITA if it was raining. Omg no no no no. Sorry, how do I use tapatalk, lol ...is that an app?